Two little surprises made my day today, and I wanted to tell you about them. Toronto has some beautiful art walls. One such wall is the Love Wall. 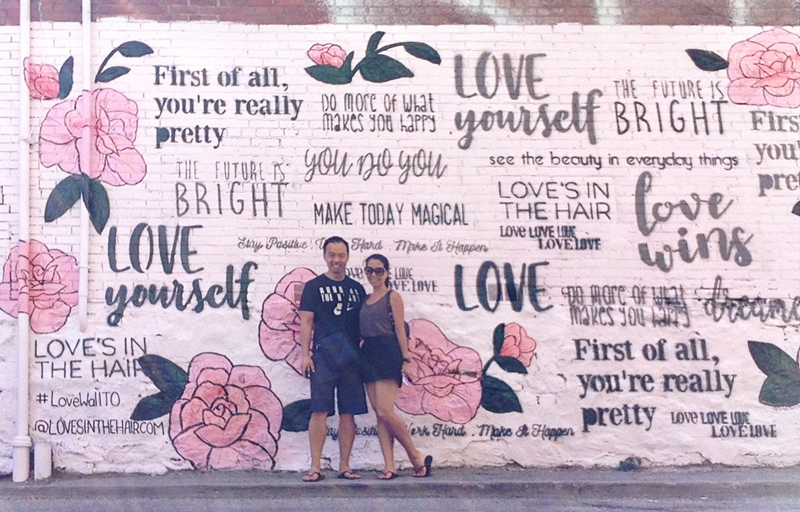 Covered with beautiful pink doodles and endearing messages, the Love Wall is always jam-packed with people wanting to take photographs of it or with it. Hubby and I walked right by it today, as we often do, and I did a double-take because there was hardly anybody there. I doubled back so I could take a photo. Then I doubled us back so we could take a photo together. I didn't have my camera with me so we used Hubby's old iPod. Every year, audiences at the Toronto International Film Festival vote for a film to take home the People's Choice award, and there is a free screening of the winning film on the last day of the festival. This is the first year we've gotten tickets to the screening. This morning, when I told Hubby I got the tickets, he asked me what the film would be. The winner hadn't been announced yet, so we decided it might be fun to allow ourselves to be surprised at the screening. The winner was announced in the early afternoon, but we diligently avoided Google and Twitter. It's oddly strange and exciting to line up at the cinema with no clue as to what you'll be watching! During the introduction, we learned that we would be watching Green Book. I had read a little about this film a few days ago but could only remember that it was highly regarded by audiences. Oh. My. Goodness. Audiences were right. Hubby and I LOVED it. This film is a crowd-pleaser that felt much shorter than 130 minutes, and I didn't want it to end. The film is simultaneously gut-wrenching and hilarious, and the acting is superb. It is an incredible film that deserves all the accolades it will no doubt receive. Highly recommended!